There are few moments in life more challenging than when a loved one passes. It is a time to honor a life lived. A casket is a central piece to honoring this transition. If you are mourning the loss of a loved one, or are planning your future to make this transition easier for your loved ones, let Alaska Coffins, supplied by Holy Archangel Liturgical Supply assist you. We use pine, a pure, simple wood that speaks to Alaskans spirit. The casket is adorned with your choice of Orthodox cross, simple cross or plain. Standard stain is a walnut stain (pictured), natural and redwood stains also available with two weeks advance notice. Available for immediate delivery anywhere within 50 miles from downtown Palmer. We deliver anywhere on the road system for an extra fee. We also are able to air ship to remote bush areas. You can also purchase a casket for later delivery as part of our pre-planning program. Burial Shroud kit with printed text in church Slavonic, including: one burial shroud, an icon to be placed in casket, a cross to be placed in casket, and a laminated and printed sheet of prayers in Slavonic. Burial Shroud kit comes complimentary with your purchase of a casket. Our caskets are built by Alaskan craftsmen, for Alaskans. Our goal is to make a beautiful, simple, affordable casket that can be supplied across Alaska. We are committed to moving beyond the standard model of expensive caskets and creating a product that is elegant, simple and locally made. 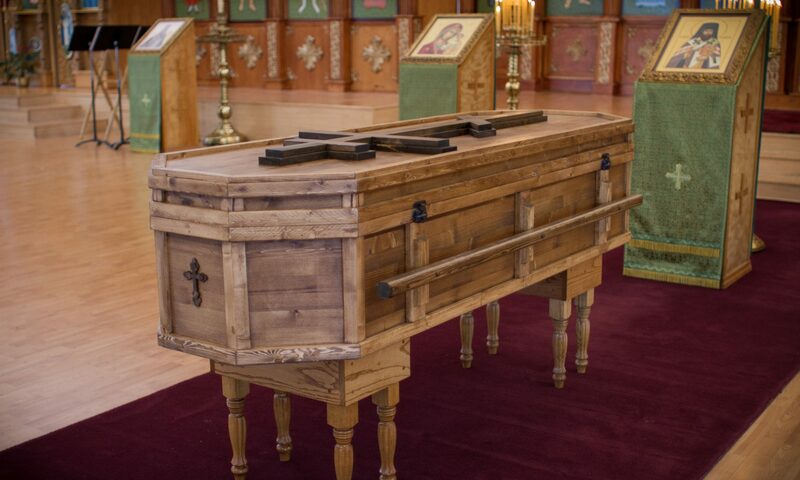 Our caskets are supplied by Holy Archangel Supply, the diocesen for Alaska Orthodox churches for over 20 years.